SCOTTSDALE, AZ--(Marketwired - Mar 13, 2014) - Beamz Interactive, Inc. (OTCQB: BZIC), a leading developer of state-of-the-art interactive music products, today announced the availability of an exclusive Beamz album featuring popular jazz artist Euge Groove's top hits for various iOS devices, including Apple's iPhone and iPad. As a pioneer in this new interactive media, Euge Groove has re-recorded versions of his most memorable songs to specifically work with Beamz so his fans can experience his music in an entirely new way. The collection of these interactive songs is titled "Groove on This!" and Euge Groove created this interactive music exclusively for Beamz. "We are extremely pleased to partner with Euge Groove and launch his popular jazz music into our interactive format," said Charlie Mollo, CEO of Beamz Interactive. "Euge's music is a great addition to our expanding interactive song library for the Beamz App." The free Beamz App for iOS devices utilizes Beamz Interactive's proprietary technology which enables users to interact with some of today's most popular songs, then instantly record and share their songs with friends. Each Beamz interactive song is setup with a unique background rhythm track and includes up to twelve different instruments, vocals and/or sound effects including guitars, bass, drums, etc. for users to creativity add into the playback of the interactive song. 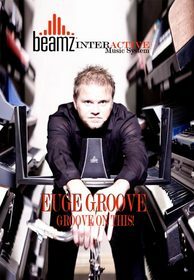 "From the moment I started working with Beamz and their interactive music I was hooked," said Euge Groove. "When listening to my top hits in the new Beamz Interactive format, fans will not only be entertained, but they can also learn about the form of the composition, isolate the different instruments, and even change the ending if they want. The Beamz App helps listeners connect with music in a whole new way -- while taking advantage of the extremely user-friendly interface of their mobile device." Euge Groove is a smooth jazz artist. His album Born2Groove debuted at #1 and spent 18 months on the Billboard Contemporary Jazz chart. He has had many Top 10 songs, several reaching #1, including: "B2G," "Religify," "SlamDunk," "Rewind" and "Get Em Going." Euge toured with Joe Cocker, Tina Turner, Eros Ramazzotti, Richard Marx, Tower of Power and Huey Lewis and the News. In addition, he has supported Paula Abdul, Heart, Elton John, Aaron Neville, Bonnie Raitt and David Benoit as a recording artist. The free Beamz App for iPads and iPhones includes 15 interactive songs with a broad spectrum of instruments from a range of different music genres. Euge Groove's album features 10 exclusive interactive songs and is available immediately for purchase within the Beamz iPad or iPhone App for $9.99. About this company Beamz Interactive, Inc.
Beamz Interactive today announced the availability of an exclusive Beamz album featuring popular jazz artist Euge Groove's top hits for various iOS devices, including Apple's iPhone and iPad. As a pioneer in this new interactive media, Euge Groove has re-recorded versions of his most memorable songs to specifically work with Beamz so his fans can experience his music in an entirely new way.